I read on ENENews that the initial radiation cloud from the explosion and triple China syndrome at Fukushima came over Idaho and turned south onto the Great Salt Lake. That cloud contained many hot particles. If you inhale a hot particle you will most likely get cancer. 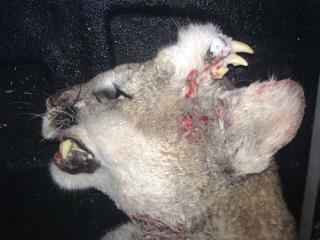 If one lands on a cougars head and stays there under the fur expect cancer. Many cancers cause cells in one area of the body to react in ways that mimic cell functions in another part of the body. My father was a physician/surgeon and had a patient grow a molar in his lung. My bet would be a genetically damaged set of chromosomes on the cats head decided to grow into a lower jaw. The hunter bagged the cougar for cat meat? A-hole.